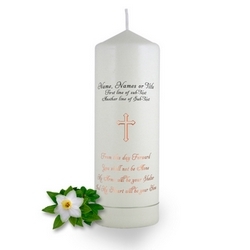 Personalised 1st holy communion gifts. Our range of first holy communion candles are ideal as gifts or for the presentation & celebration of a persons first holy communion. 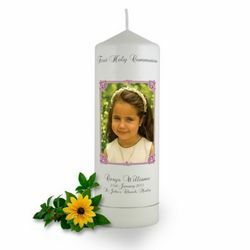 They preserve the wonderful communion occasion and can be displayed or kept as a family treasure or given as a Holy Communion Keepsake to attendees and relatives. Our First Holy Communion Candle provides something a little bit different and is a perfect special gift and present. A communion is a special occasion. It represents an important milestone in a child’s spiritual life. Brinley Williams has just the right products to crown this occasion. They are are unique, personalized and symbolic and are delicately designed to ensure it gives you the right you desire on this special day. Elegant, charming and practical, our wide variety of personalised candle designs will help make if a happy and joyous occasion and give your loved ones a fun keepsake from this once in a lifetime holy celebration. 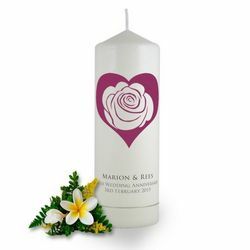 Distinctive and made by the most incredible hands, these candles are perfect for marking your celebration. There’s nothing better than having a spiritual keepsake out of a day filled with love, faith and togetherness. 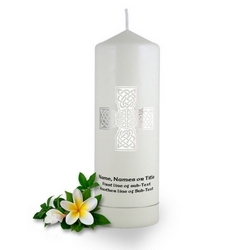 From our exclusive confirmation favor candles to our Celtic cross communion that features amazing enhancements, you can never go wrong. You can easily pair up your candles with our one of a kind candles holder to give it that chic and complete look. Make memories like you’ve never made before. Our candles are exactly the high quality products you are looking for to enlighten and illuminate your day, your table, and your guests and to lighten the atmosphere.